Dr. Gay Frederick kicks her work load at Pacific ID up a few notches in September 2012, as she goes from summer-only to year-round half time until July 2013. Pacific IDentifications offers biologists and archaeologists the most complete analysis of bone and shell from western North America. The identification of whole or fragmentary skeletal elements (both cranial and postcranial) from marine and freshwater fish, land and sea mammals and birds from western North America are our specialty. Pacific ID also provides training in skeletal anatomy and bone identification worldwide (especially for fish), using a combination of written manuals, personal instruction, computer image databases and video support. In addition to preparation of skeletal reference databases for comparative taxonomic research and size estimation projects, independent valuations of existing institutional or donated collections are offered. The reference collections of skeletons we use (at the University of Victoria (Anthropology) and the Royal B.C. Museum) cover an exceptionally broad range of species. In our experienced hands, the organization of these collections by bone element enables rapid identification of even the most complex and fragmentary samples. 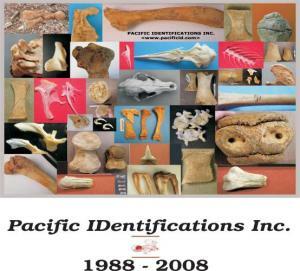 Pacific IDentifications Inc . began business in 1988 and is now a registered limited company. Our professional staff consists of Susan Crockford (B.Sc., Zoology; Ph.D., Interdisciplinary Studies), Rebecca Wigen (M.A., Anthropology) and Gay Frederick (Ph.D., Archaeology). Various students assist as needed. 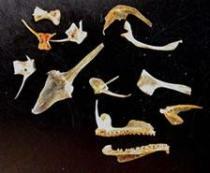 A list of specimens held at the University of Victoria's skeletal reference collection provided on request.